Jeep is an iconic 4×4 SUV brand, giving anyone a supercharged driving pleasure. But even the most formidable Jeep won’t efficiently run if you fail to provide the proper upkeep it needs. Keep your Jeep running tough on and off the road with scheduled tune-ups and quality repairs in our shop. There’s nothing like driving a manual Jeep Wrangler. The manual transmission lets you become one with your Jeep as you cruise down the highway or conquer the trails. But the fun can stop if your vehicle has a failing clutch. If you suspect there’s something wrong with your Jeep’s clutch, bring the car to our shop in Towson, MD, so we can pinpoint and address the issue right away. Contact us today to schedule an appointment! The differential assembly of your Jeep allows your wheels to turn at different rates of speed. It prevents tire scuffing when you’re making sharp turns whether on or off-road. Make sure your Jeep’s differential is fully functional before you hit the road or trail again. Let our Jeep technicians inspect it and provide necessary repairs. Driving with an exhaust leak can be harmful as the fumes contain carbon monoxide. If you hear a loud rumbling noise coming from your car or your gas pedal vibrates while you’re driving, head to our shop as those are signs of exhaust leaks. With a team of Jeep specialists, we ensure exhaust leak repair is completed promptly, so you can enjoy driving your 4×4 again. The primary job of your Jeep’s cooling system is to prevent the engine from overheating. So, it is vital that the cooling system is always in top condition. Trust our ASE technicians to run an accurate diagnostic test on your cooling system to find out any issue and provide necessary repairs as well. 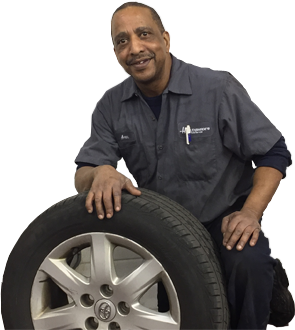 For Jeep repair and maintenance, trust only the Towson’s experts. Book an appointment today.